Did we need another project? The Riviera arrives. We’ve done it again. Embarked on another entirely new project while the Thunderbird remains unfinished. 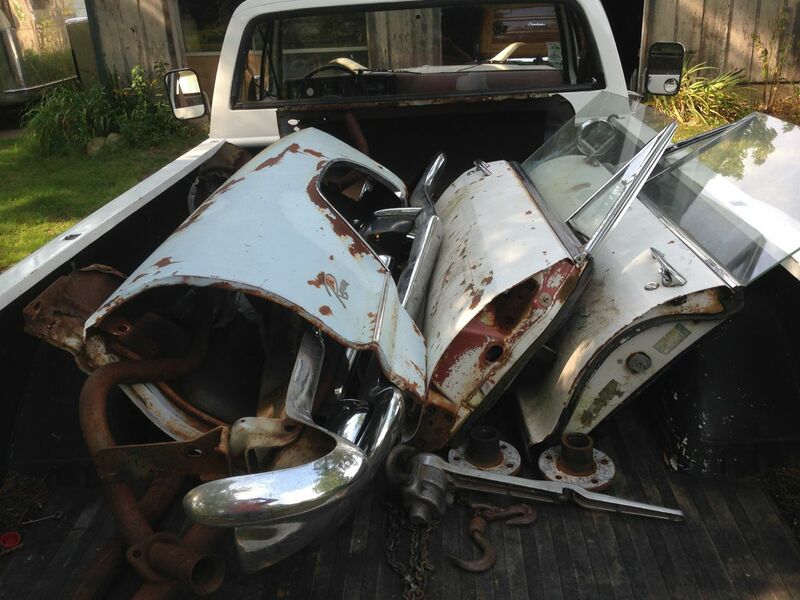 As usual this was too good a deal to pass up, so today was spent driving the GMC back and forth to Grand Ledge to haul home not one, but TWO Buick Rivera’s, a ’63 seen here on the trailer, and a ’64. Both are sans engine and trans, having been long ago stripped of their 425’s for hot rod projects. The ’63 here is inexplicably missing it’s left front fender, but there are two (?) right front fenders. (Evidently, to rights don’t make a left…) It has every option available at the time, automatic headlights, tilt, cruise, leather, wood trim on the door panels, etc. The interior is wasted, but happily, replacement upholstery is cheap, at least in vinyl. The trunk is filled with all the missing trim, and duplicates of all the hard to find pieces. The body is fairly solid, great by Michigan standards, and I have a good 425 Nailhead for it in the shop that I got from another buddy. On the ground at my buddy John’s place. This one is the ’64, and like the ’63, it’s missing it’s 425. It has a vinyl interior, and is the “standard” trim level, which means it doesn’t have the wood grain inserts on the door panels, but it does have the correct shifter for a turbo 400 in the console, which is good, factory A/C, and tilt wheel with that beautiful fluted aluminum column. It also has air in all four tires, which is also good, as far as rolling it around the yard is concerned. The missing parking lamp bezel and trim are in the trunk, as are all the other trim pieces not on the car. It has what looks like an aftermarket installed vinyl top, which is in tatters. The rear bumper is slightly tweaked, but there’s another one in the pile of parts. The exhaust pipe is hanging down because when I pushed it off the trailer, the resonator got hung up in the dirt and broke the rubber strap, so it’s dangling, but the rest of the exhaust system is complete and intact. The floor pan has a little rust in the drivers side footwell, but no rust visible anywhere else underneath. There’s a matching wheel in the trunk, and Uniroyal Tiger Paw tire has air, so who knows why the one mismatched wheel and tire, but, they all roll, so it’s all good. 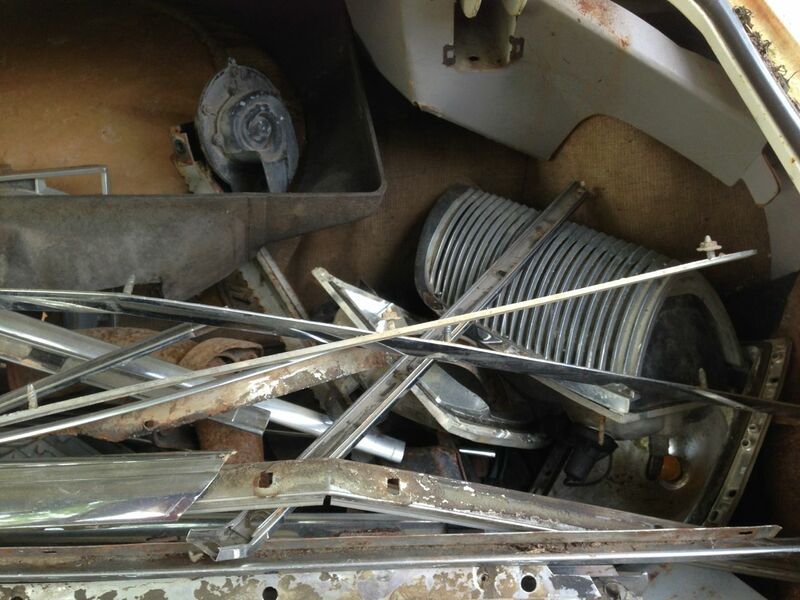 In this pile of parts in the back of the truck are two complete doors, with the wood grained door panels intact, with glass and power windows. There are three front bumpers, one rear bumper, two right front fenders, one extra door skin (they bolt on to the inner door panel), two front hubs, one brake drum, and a pair of front exhaust pipes, never installed on a car. In the trunk of the ’63 are two grills, 4 headlights, 4 parking lights, 3 backlights (rear window glass) a pile of quarter panel trims, wheel opening trims and body emblems. Oh, and an extra pair of side door glass and tracks. 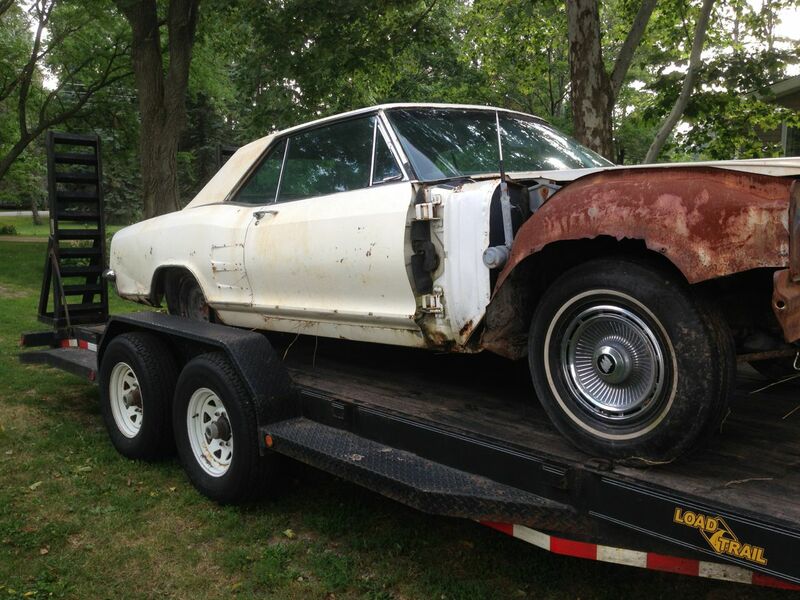 The plan at this point is to sell the ’63, along with the extra parts, the 425 engine, and a good running Chevrolet 350 TBI engine and 4L60 trans as a Riviera “Kit” car, to fund building the ’64. Not that the ’64 is more desirable, but it’s got the correct shifter and console for a Turbo 400 transmission, what is (happily) what’s bolted to the 454 engine in the motor home that I’m parting out, that will plop nicely into the Riv. Which, in reality, is the reason I brought the Riv’s home, simply to have something to put the 454 in, which therefore justifies hauling IT home. So, stay tuned for progress on this latest project to get in the way of the Thunderbird completion. 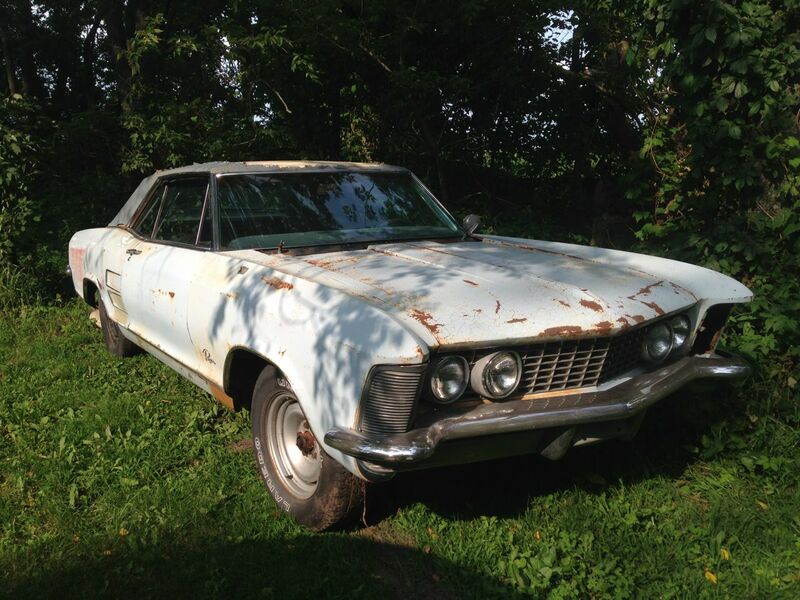 Actually, a Riviera is a good garage mate for the ‘bird, since the Riviera was developed as a competitor to Fords 4 passenger, luxury coupe, the Thunderbird. They’re both iconic mid-century American “performance” coupes, so it’ll be fun to have one of each. Makes sense to me. Loved your recent Tin Can Tourist event and show. What a way to spend a weekend. Everything I love except pole dancers. And I’m sure with enough to drink at the Tiki Bar that could happen. Love those old Buicks too. 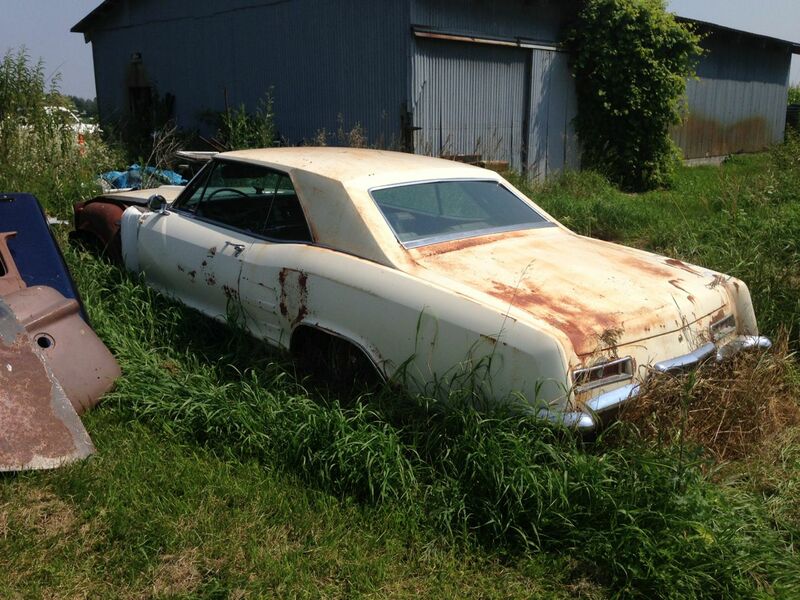 Looks like the poor old T-Bird has to wait….and wait! Thanks! The Bird is actually going to get done before I start ANYTHING on the Rivi! I know what you mean, Brian! 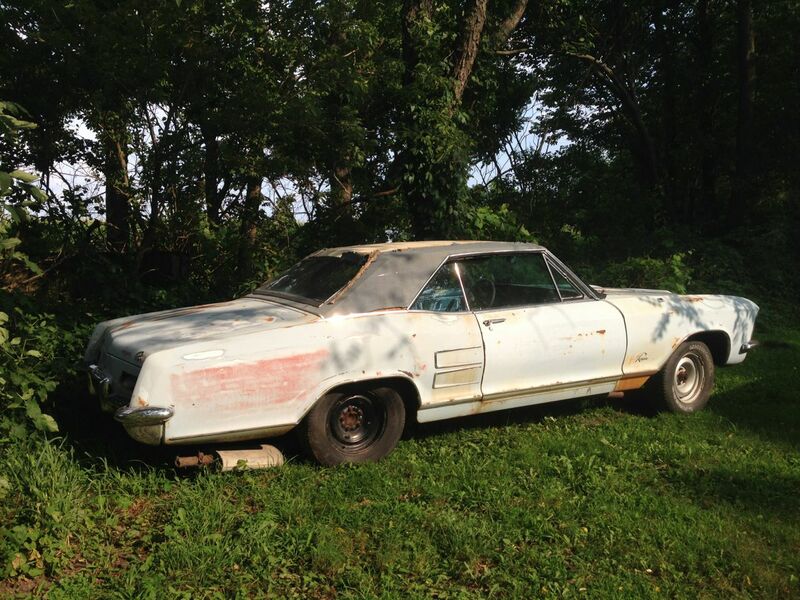 I just picked up a 64 Thunderbird to accompany my still unfinished 67 Cadillac. I gotta get rid of something! Oops. Typo. It’s a sixty FIVE! That is WAY nicer than anything I’ve ever brought home! Good luck with it Brian. An LS would be better, but I have the 454, with a mere 14K miles, and I want to use it. If I could sell it, or swap it for a complete 4.8 or 5.3, I’d do it in a heartbeat. Trailer Trash at Gilmore Car Museum. Marketing 101. Will we sell one of the two Riviera’s?